Background: African Americans have higher rates of cardiovascular disease (CVD) mortality than other ethnic groups. Young adults are prime targets for intervention strategies to prevent and reduce disease risk. The study purpose was to determine the level of knowledge of lifestyle risk factors for CVD among young African American adults in Phoenix. The results will be used to guide the development of CVD outreach programs targeted to this population. The Health Belief Model was used as a conceptual framework. Methods: A convenience sample of 172 African American men and women aged 18-26 years completed a questionnaire adapted from the American Heart Association national surveys. Descriptive statistics were compared by age, gender, education level, and health status variables including BMI, smoking status, and physical activity. 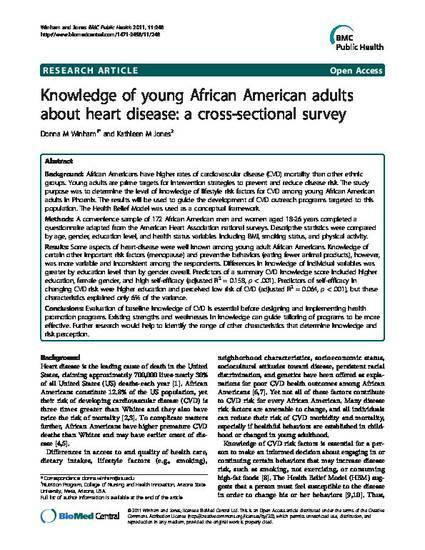 Results: Some aspects of heart-disease were well known among young adult African Americans. Knowledge of certain other important risk factors (menopause) and preventive behaviors (eating fewer animal products), however, was more variable and inconsistent among the respondents. Differences in knowledge of individual variables was greater by education level than by gender overall. Predictors of a summary CVD knowledge score included higher education, female gender, and high self-efficacy (adjusted R2 = 0.158, p < .001). Predictors of self-efficacy in changing CVD risk were higher education and perceived low risk of CVD (adjusted R2 = 0.064, p < .001), but these characteristics explained only 6% of the variance. Conclusions: Evaluation of baseline knowledge of CVD is essential before designing and implementing health promotion programs. Existing strengths and weaknesses in knowledge can guide tailoring of programs to be more effective. Further research would help to identify the range of other characteristics that determine knowledge and risk perception.